The 1888 Duluth Bethel, designed by Oliver Traphagen, at the northwest corner of Lake Avenue and Sutphin Street, demolished in 1948. Most Duluthians are aware of the Duluth Bethel Building, the V-shaped structure just above Superior Street east of Mesaba Avenue. Since it was first built in 1910 that building has acted as the home to Duluth’s Bethel Society, which serves those recovering from addiction problems. Few Duluthians living today, however, know that the Bethel operated out of a tent near the base of Minnesota Point before becoming one of the Zenith City’s most important charitable organizations, all thanks to the tireless efforts of Dr. C. C. Salter. Reverend Doctor Charles Cotton Salter of New Haven, Connecticut (Yale, class of 1852), first came to Duluth by way of Minneapolis in 1871. He became the pastor of Minneapolis’s Plymouth Congregational Church in 1862 after serving time as a chaplain with the Union Army. In late 1870 Salter was recruited to Duluth by the founders of Duluth’s Pilgrim Congregational Church, led by Major Luman H. Tenney and his wife, who had organized the church that year. Salter came to Duluth in January 1871, and later that year the parishioners of Pilgrim Congregational built a modest wooden house of worship at 2 East Second Street. Salter served as minister until 1876, when poor health sent him abroad for a cure (he had been plagued by health issues since his time in the Civil War). After a stint with a congregational church in Denver, Salter returned to Duluth and Pilgrim Congregational on May 1, 1881, and was “greeted with a perfect ovation.” He was not here long, resigning on November 28, 1881, “under the imperative orders of his physician,” who sent him to Florida for his health. When he recovered and returned to Duluth, his work eventually turned to running the Duluth Bethel Society. By the mid-1880s it had become known as Finn Town for its large population of Finnish immigrants, and at that time the Duluth Bethel was hardly considered a success; it had no facilities to house or feed the men it was trying to help. Much of the organization’s early efforts involved little more than a Protestant minister preaching from atop an empty box at the corner of First Avenue East and Superior Street. When Salter was named the Bethel’s chaplain in 1887, he changed things. Bethel is Hebrew for “House of God,” and that’s what Salter intended to build: a house to shelter those in need and offer its inhabitants a steady diet of food and religion. Every man would be welcome at Salter’s building, for it was his strong belief that “no soul is too low to be received or ministered unto at the Bethel.” But before that house could serve anyone, he needed to finance its construction. Salter’s fundraising drive began almost as soon as he was appointed chaplain. To increase the visibility of the organization’s work, he rented a small store on Lake Avenue South adjacent to Sutphin’s Dock, where for a few months he conducted gospel meetings and a Sunday School. He later moved services into a tent. During this period he lobbied individuals and organizations for donations. Three of Duluth’s banks offered $500 each, over $12,000 today. He even convinced Duluth’s premier architect, Oliver Traphagen, to design the new building. Traphagen had worked for Salter before, building a townhouse called Salter Terrace at 301 – 307 East Third Street in Duluth’s upscale Ashtabula Heights neighborhood. When first built, the townhouses were all occupied by Salter family members—he and his wife Maria had five children, all adults at the time. He and Maria would later move to the Glen Avon portion of Hunter’s Park, another neighborhood first settled by the wealthy. All this would indicate that Mr. Salter himself was well off, and he likely contributed financially to the building’s fund drive as well. But his greatest gift to the organization was himself: he refused to take a salary for his work with the Bethel. 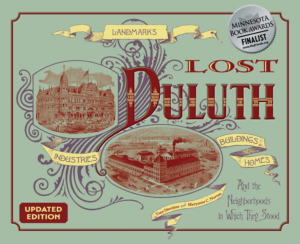 Salter apparently considered the area near Sutphin’s dock an ideal location, so he purchased a lot on the northwest corner of Lake Avenue and Sutphin Street, named for the dock’s owner—and the 1886 mayor of the Village of Duluth—J. B. Sutphin. The building Traphagen designed for 246 Lake Avenue South, a simple two-story clapboard structure with a corner tower, was completed in 1888. It held reading rooms, a chapel, a cooking school, and a restaurant as well as furnished rooms for sailors, lumberjacks, and miners. Salter held a religious service each evening. By 1893 the Lake Avenue Bethel was running out of room, so workers raised the building and added a third floor beneath the original structure; six years later a fourth floor was added to the top to again increase space for the growing demand of lodgers. Many of the Bethel’s “clients” were coming from Duluth’s growing Bowery, at the time a collection of more than twenty-five saloons and a number of residential hotels that were home to the same kind of itinerant workers found along the industrialized portion of South Lake Avenue. So in 1894, to better serve the men of the Bowery, the Bethel opened a branch in a rented building along the 500 block of West Superior Street. Salter’s health issues finally caught up with him on December 19, 1897. When he passed away, his funeral was reported to be the largest Duluth had ever seen. Apparently so: Despite his long ties to Pilgrim Congregational, services were held at First Methodist Church, considered the largest building in Duluth at the time. Once the church was filled, the line of mourners who did not get in stretched for two blocks. In a highly symbolic gesture, saloon keepers throughout the city closed their businesses during the funeral. The Bethel, of course, continued without the man who first made it a success. By 1910 the Lake Avenue Bethel again needed more space—and a great deal of repairs. Instead, the organization raised funds for a larger building at 23 Mesaba Avenue: that V-Shaped building mentioned earlier. The Lake Avenue Bethel’s last service was held on April 29, 1911. 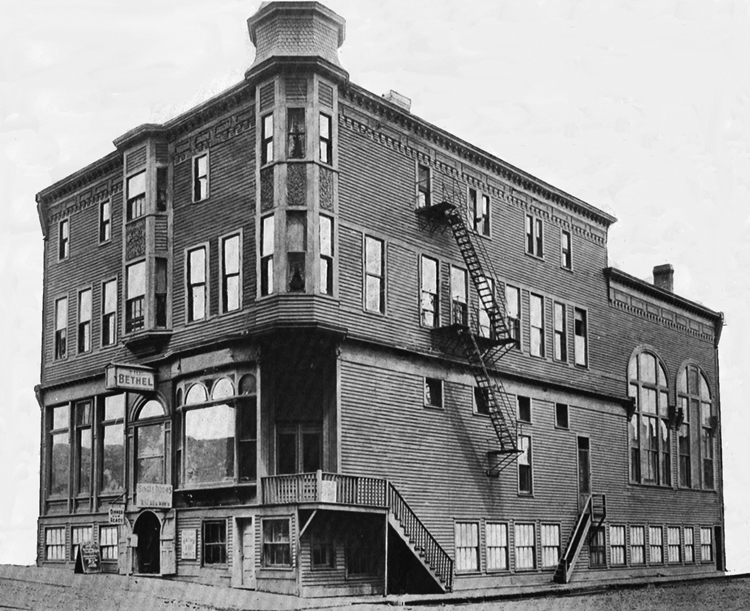 The building became the People’s Hotel and Tavern until it closed and was demolished in 1948. 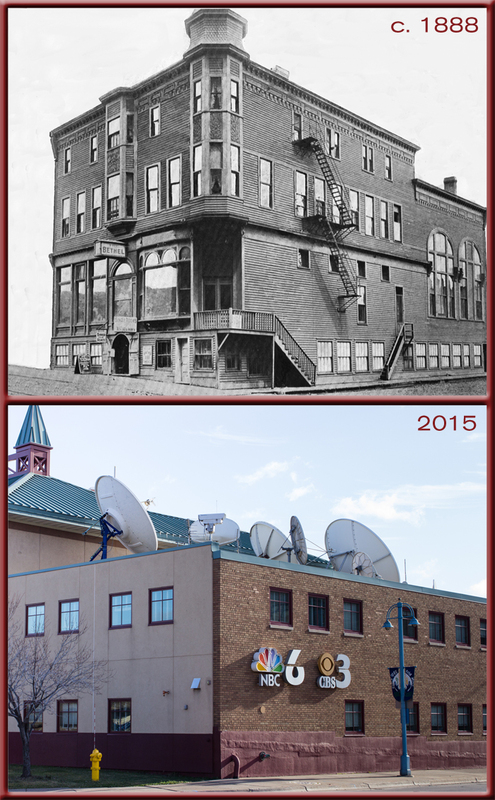 Today the KDLH and KBJR television studios occupy the Bethel’s original site.